Last weekend, one Firewatch player was having a monetary dilemma. They’d beaten the game. They liked the game, which tasks players with hiking in the Wyoming wilderness. But they also felt that spending $18 for a 2-3 hour experience might be asking for too much. So this game was 18$. I purchased it because i enjoyed games like this. And I enjoyed this game. Alot. Like, way more than a healthy amount. But it was 2-3 hours. I feel like there could of been more, and im thinking of refunding. But here is my problem: I loved this game. It was a unique game with awesome narration and storytelling. I like the developers. I mean seriously, have you seen how active they are on theese forums? What other dev is that connected to their community? I want to support the developers, but there was so much more i could of got with my 18$. Should i refund, or hold on to it? Steam, as you might already know, offers players refunds “for any reason,” so long as the request is “made within fourteen days of purchase, and the title has been played for less than two hours.” Ostensibly, Undercover Fish could have made a refund request for Firewatch despite enjoying the game, but they wanted to get some input from other players before pulling the trigger. Sure enough, people responded to Undercover Fish’s post, arguing for and against getting a refund for Firewatch. One of the responses actually came from a Firewatch developer, Jane Ng, an artist at Campo Santo (full disclosure: I’m friendly with one of the developers there). I thought about not responding, because normally ppl who want to refund are rude and unpleasant and I choose to not engage and dwell on it. You seem nice and I figured what the heck, why not have a conversation about this, now that I have read it and it’s right here in front of me. So here is what I think. As the developer. Sorry if it’s a bit stream of consciousness because I want this to come from the heart. The 11 of us all took a lot of risk to make this, and sacrificed financially to give Firewatch a chance. We all could have had much better paying jobs elsewhere, but we all thought this game idea had potential to be something special. We seemed to like each other ok, so we all took a big leap of faith. Two years, we say. Let’s give this a go, worst outcome is we all hate each other and go back to various money jobs, but we all could say, WE TRIED. Two years +. We are all crammed in a tiny office, sharing one bathroom. It is not a glamorous thing, making an independent game. It is just a small room full of computers and a used microwave and $10 office chairs we luckily got from craigslist. Life happened during those two years: there were big breakups, profound illnesses of loved ones, a baby, etc. The dev team got to be like family, because that’s how making an indie game is, you are all in it together, through thick and thin, supporting one another bc if you don’t, there is no way in hell this game would get made, let alone any chance of it to be worth more than a bucket of ♥♥♥♥. We were excited, but terrified. We felt free, but were constrained. I have been in this industry for 15 years almost, and this is the hardest I have ever worked. We all gave it our all, to make this weird thing, and we had no idea if it was any good to anybody else. All we could do, was try the damn hardest to make something we are honestly proud of. At the end, if this was a commercial failure, all we have got is what we have made. Nobody could take that away. So yes, I am sad when people think this game is not worth the money we asked for (which we thought was a fair ask). It makes me feel like I failed them. It is ok if people don’t like the game, but it affects me personally a lot, when people feel like it was not -worth- the time they engaged with it. But do I blame you for wanting to get the most out of your $18? No. I don’t know your financial circumstances. $18 might be a lot. Or even it isn’t a lot, why shouldnt’ you try to get the most out of it? That’s a fair desire. That’s why we asked for $18 too, because money is something we could all use more of. So I supopse in conclusion, if you do refund, I am not upset. It’s on me to learn not to care too much. All I ask is that maybe sometime in the future, when the game goes on mega dirt cheap sale, you could gift tthe experience to someone else you think will enjoy it like you did. I have made my decision to keep the game. Campo Santo had more balls than Donald Trump on steriods to make this game, and they deserve the money. Feel free to talk about games/this game/developers/morals/refunds or whatever, but i will not change my decision. 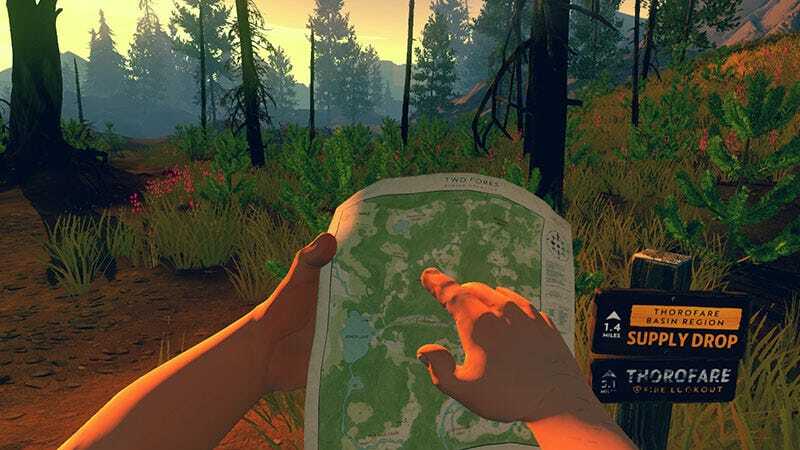 You can read our Firewatch review here.